(Nanowerk News) How can light which has been captured in a solar cell be examined in experiments? Jülich scientists have succeeded in looking directly at light propagation within a solar cell by using a trick. The photovoltaics researchers are working on periodic nanostructures that efficiently capture a portion of sunlight which is normally only poorly absorbed. Until recently, light trapping within periodically nanostructured solar cells could only be analysed using indirect methods, as captured light is not visible from outside of the solar cell. However, the quantum mechanical tunnelling effect of light allows it to be tracked if a light-conducting component is brought extremely close to the cell’s surface. 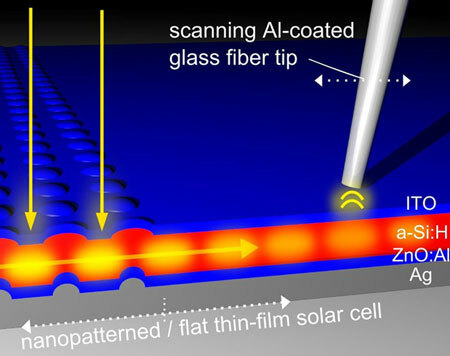 Through use of a glass fibre tip, the researchers were able to measure the amount of light that had actually been captured in the solar cell using a method called near-field optical microscopy. Light trapping plays a particular important role in optimizing thin-film solar cells. These solar cells are easier to manufacture and require less material than conventional crystalline solar cells, but they are not yet as efficient. The layer in which energy conversion takes place is only about one thousandth of a millimetre thick. Therefore, longer wavelengths in the infrared region are only poorly absorbed when the cell is exposed to direct sunlight. Periodically nanopatterned interface layers allow for better absorption of the incident light. These interfaces couple incident light into the thin silicon layer. Based on the new experimental approach, scientists from the Institute of Energy and Climate Research at Forschungszentrum Jülich showed that there is a direct link between the nature of the nanostructure, the absorption of specific wavelengths of light, and in particular the efficiency of the solar cell. The approach, presented in the specialist journal Nano Letters ("Nanoscale Observation of Waveguide Modes Enhancing the Efficiency of Solar Cells"), also opens a range of new possibilities for investigating applied nano-optical components.